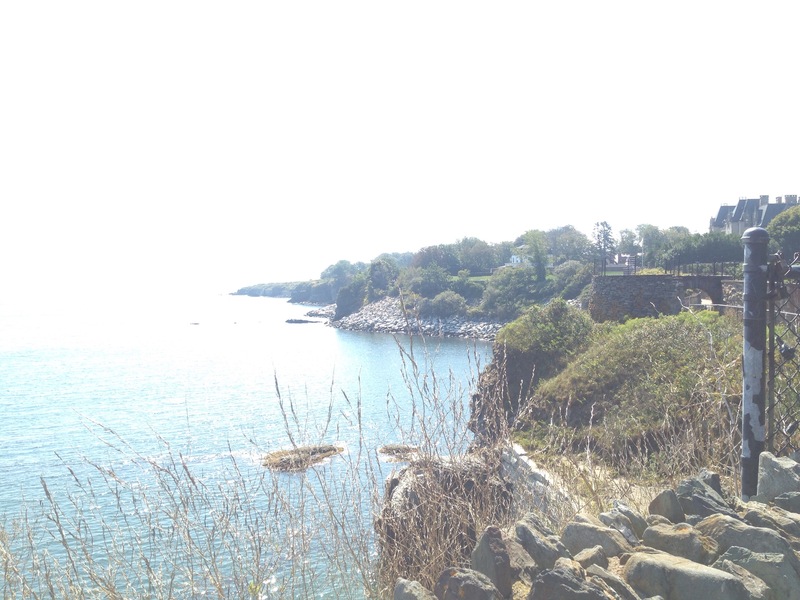 Island hop to charming Newport, Aquidneck, Rhode Island for a food scene that is unexpectedly diverse and refined for the town’s size and relatively remote island location. Along the foodie’s paradise that is Thames Street is Stoneacre Pantry, a small, locally owned and sourced restaurant that emphasizes the quality and sustainability of local farm produce. Both the restaurant itself and its menu are intimate, like offerings from a private chef at a dinner party. The wait staff certainly are attuned to their customers’ needs, ensuring a fabulous experience by the end of the meal. As an example, the first wine I tried (a boutique French red) was not a match for my palate. The accommodating waitress allowed me to try two more reds before I found one I really enjoyed – and switched my friend’s glass when she discovered this red’s deliciousness. 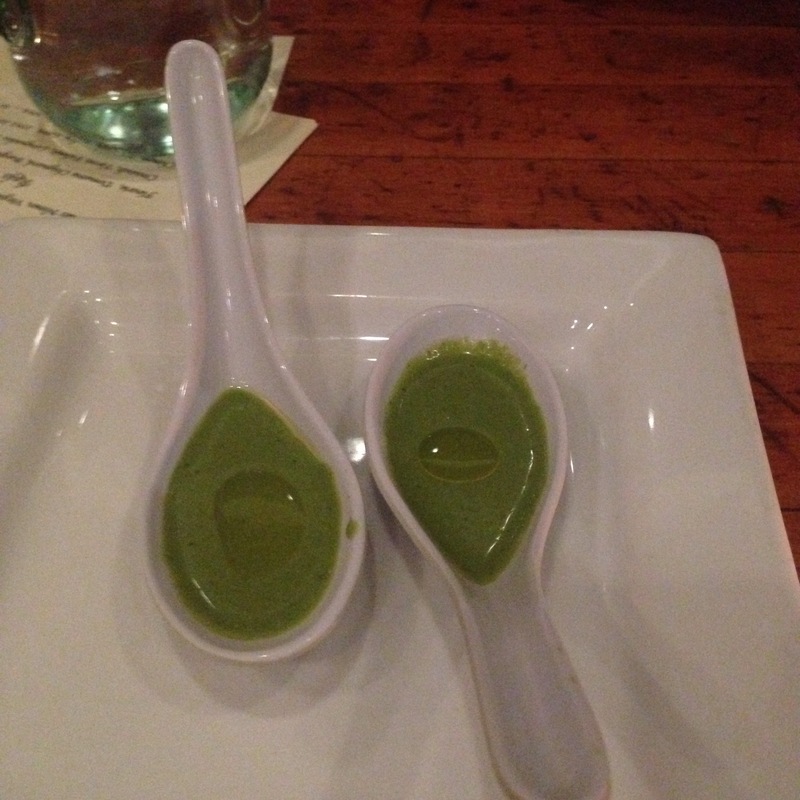 To start, we enjoyed an amuse bouche – elegant, simple spoonfuls of green gazpacho along with grilled bread. The soup’s refreshing, earthy tang was a great palate cleanser. 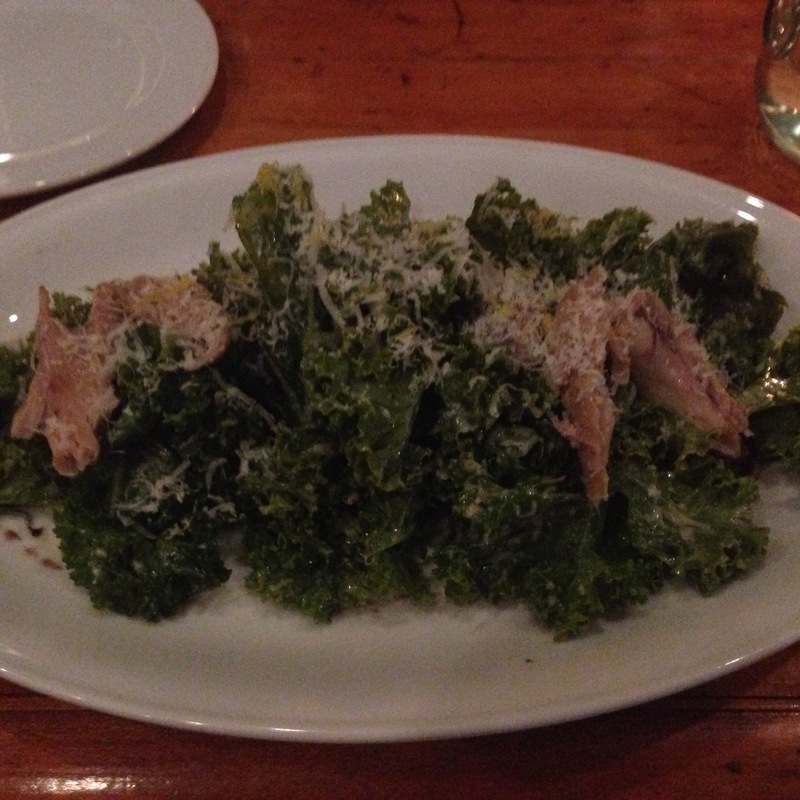 We both chose a starter salad of kale massaged with a pungent, salty miso Caesar dressing, asiago cheese, and confit chicken. It was a satisfying portion with vibrant flavors. 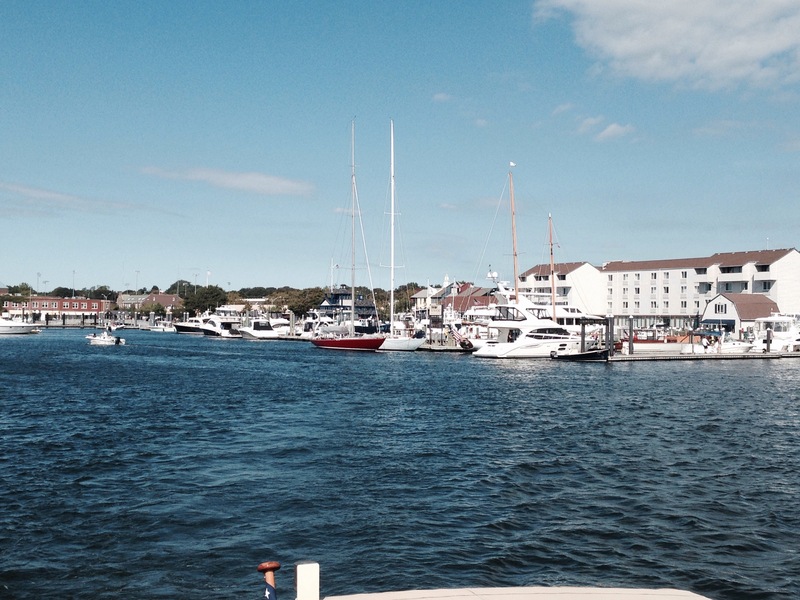 For our main courses, we went for vegetarian and fresh New England seafood, respectively. The vegetarian plate consisted of a red bell pepper roasted over high heat and stuffed with a fluffy mixture of spinach, ricotta, and pine nuts. 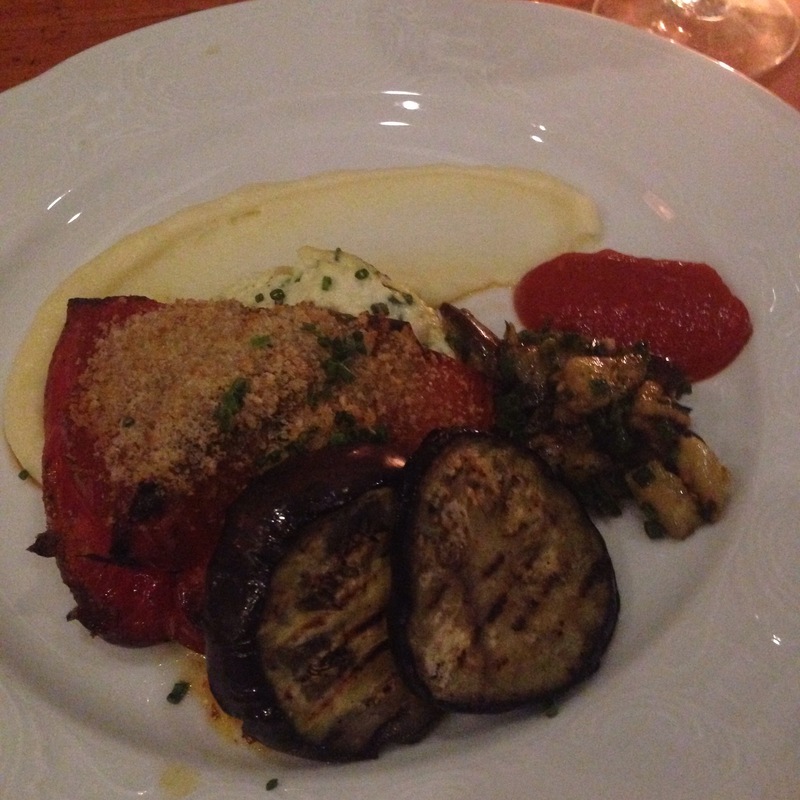 Lightly seared eggplant and decorative swipes of red pepper coulis and a potato purée accompanied it. The dish was cohesive and perfectly executed. 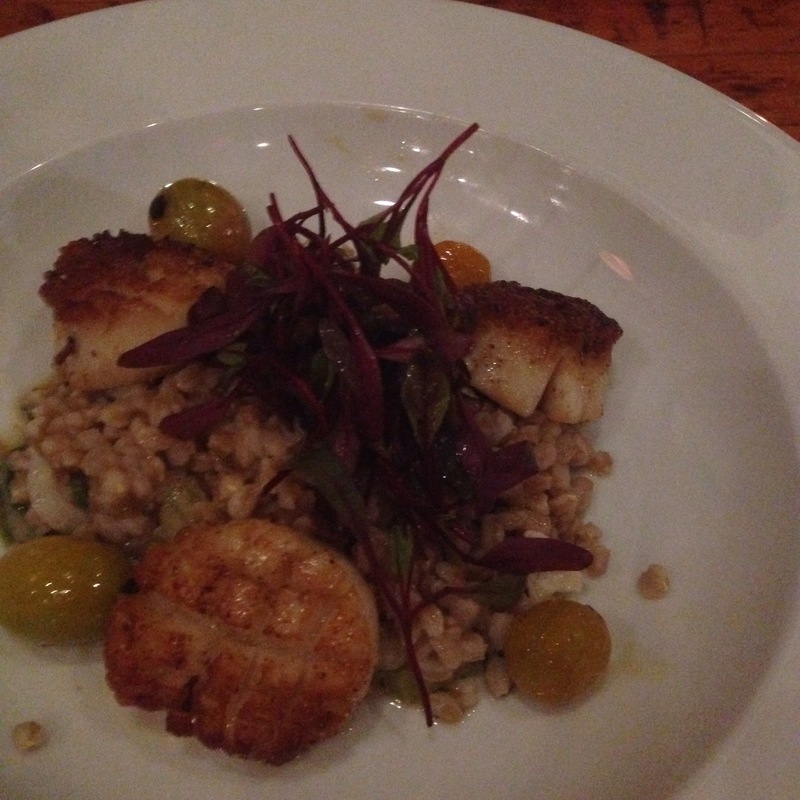 My friend’s seared scallops had an exemplar wisp of crust on two sides. An unexpected farro pilaf, interspersed with a touch of cauliflower florets, was the sort of side dish that signifies the promise of nutrient-dense foods when prepared with a deft hand. It was wonderful and could have been made into an entree in its own right. 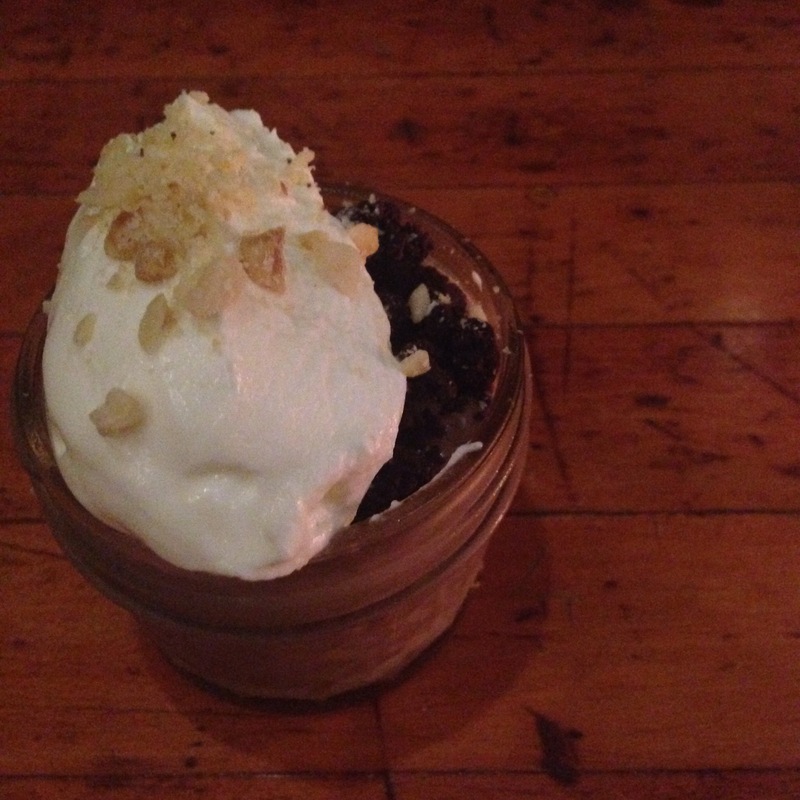 You know you have stumbled upon an irresistible dessert when you order one to share and immediately realize that in no way is it possible to share. Stoneacre’s milk chocolate mousse was that dessert. Like a parfait surprise with its hidden layers, the first bite is a slightly tart, subtly sweet whipped creme fraiche and cocoa streusel that only adds to the anticipation of what is next to come: The light cloud of the milk chocolate mousse. Lest one feel disappointed to near the bottom of the jar, one reaches the dessert’s most unexpected element – a perfectly intense salty-sweet, liquified toffee. While toffee might have been a more apt descriptor for the salty butterscotch, we couldn’t get enough of this sauce without equal. Full and satisfied, we couldn’t turn down the simple homemade truffle served upon delivery of the bill, it was a perfect sweet way to ease the pain of the end (and $) to a wonderful dining experience. I enthusiastically recommend Stoneacre Pantry to any visitor to Newport.